And by appointment for groups of 10 or more. Admission: Adults: $4.00; Students, Seniors: $3.00; Children under 6 and members: free. An optional 30-45 minute tour of the house is included. JGarden Description: The site upon which the Japanese House (as it's known to Philadelphians) now stands has had some kind of Japanese structure since the 1876 Centennial Exposition, when the Japanese Bazaar and garden were in the area. After the Centennial Exposition, the site was occupied by a gate of a 17th century Buddhist temple. The gate was transported to the United States for the 1904 Louisiana Purchase Exhibition in St. Louis and then moved to Philadephia in 1905. It was destroyed by fire in 1955. The Japanese House was built in Nagoya, Japan in 1953. The entire building, designed by Yoshimura Junzou, was presented to the Museum of Modern Art New York by the America-Japan Society of Tokyo for an exhibition held in 1954-55. After its stint in the MoMA courtyard, it was given to the City of Philadelphia and later reassembled at the current site in 1958. The garden was designed in conjunction with the re-assembly by Sano Tansai. To honor the U.S. Bicentennial, the Japanese government made a grant in 1976 to the City of Philadelphia for extensive repairs to the house and garden. 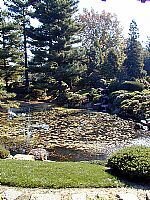 The Friends of the Japanese House and Garden was organized in 1982 to continue the preservation of the site. Repairs and renovations have continued since then as funding becomes available. The most recent funding effort allowed the hinoki roof on the building to be restored. For more details on the history of the garden, there's a really great article by Christeen Taniguchi . The Pine Breeze Villa is located on the grounds of the Horticulture Center, in West Fairmount Park, Philadelphia, near the intersection of Belmont Avenue and Montgomery Drive. By automobile, take the Montgomery Drive exit from I-76 (the Schuylkill Expressway), turn west on Montgomery and take the first left; pass through the gate and follow Horticultural Drive around the greenhouses to the Japanese House. Park behind the Japanese House complex. The Horticulture Center may also be entered from Belmont Avenue by turning east onto Montgomery Drive. By public transportation, take SEPTA bus 38 from Center City or the Wissahickon Transfer Station to the intersection of Belmont Avenue and Montgomery Drive. The Japanese House is a five minute walk down Montgomery from the bus stop, through the iron gates and over the hill to the right.